The hay is in the barn, and the long-awaited taper portion of the swimming season has begun. 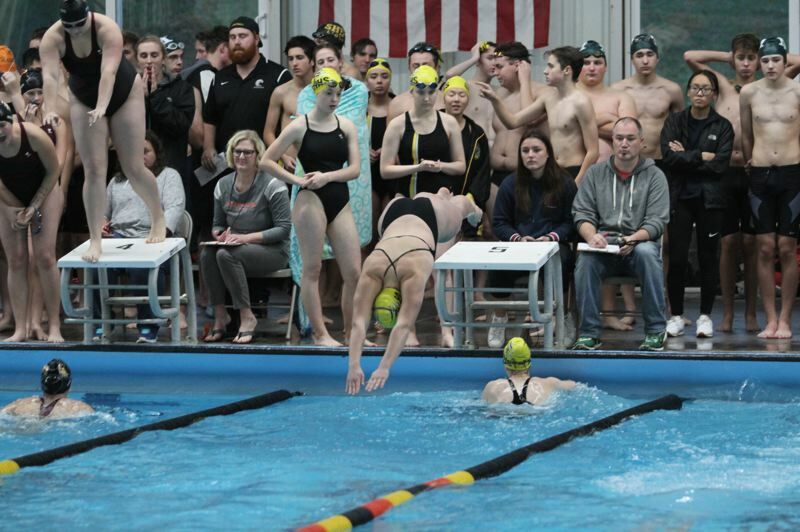 The St. Helens boys and girls swim seasons are coming to a head, with the Northwest Oregon Conference championship meet Friday and Saturday at Parkrose High. The Lions will be riding high after the girls knocked off La Salle Prep 96-66 and the boys barely fell shy of the Falcons, 83-76, in St. Helens' final NWOC dual meet of the season last week at St. Helens. Each showing was another upswing for a Lions program searching for a top-three finish by both the boys and girls at the district meet. The 'A' finals begin at 1 p.m. Saturday. "I want them to do their best and come away feeling good about their performances," St. Helens coach Chelsie Orr said. "I want them to swim their best, have a great district and not have any regrets. And I want them to be good teammates and represent their team well in how they're acting in and out of the pool." As of Monday, St. Helens took off the gas in terms of practice yardage and intensity. Rest and load management began taking precedence over pedal-to-the-floor training. But tapering by no means equates to personal records. Each swimmer is affected differently depending on mental preparation, nutrition and rest leading up to their races. But the hope is each Lion swims his or her fastest times of the year and flourishes on the district stage, feeling refreshed as well as energized by the competitive vibe. Orr said the St. Helens girls are on schedule. Freshman Molly Wheeldon goes into the district meet as the second seed by just hundredths of a second in the 200-yard individual medley and has a great shot to make the Class 5A championship meet. Molly Wheeldon, senior Olive Owens and junior Maggie Wheeldon played critical roles in helping knock off La Salle Prep head-to-head. Owens is the No. 1 seed in the district 200 freestyle with a two-second lead over the next fastest swimmer going into the district meet. Beyond that trio, the Lions have swung the balance of power this season with an expanding roster of district-final quality swimmers. "Swimming has a lot to do with depth," Orr said. "You have to have a strong, big group of girls. We have about 12 girls who aren't the superstars of the team, but together, collectively, they give us not just those first-place finishes but thirds and fourths. Those points add up. "As a whole, they've done their job, and that's what contributed to the success after La Salle." Scappoose and Parkrose both are likely to be formidable foes for the Lion guys when it comes to the tough NWOC team race. For St. Helens, Jake Maher is the second seed in the 200 IM by less than a second and holds the top seed in the 100 breaststroke by more than three seconds. He's a contender to win both events and is the favorite in the 100 breaststroke. Sophomore Ryan Maher broke St. Helens' school record in the 100 butterfly this year yet is two seconds behind a Hillsboro senior and will have to fight to punch his ticket to state. Orr said she has placed her athletes in the best position to maximize their district standing. "They're in their best events, and they're going to do as well as they're going to do," she said. Orr said she is expecting great times from the boys' relay teams. Even if the Lions don't win those events, their marks figure to be in the mix for state wildcard berths. St. Helens' 200 medley relay ranks third in the district, about three seconds behind Parkrose and Hillsboro, and the Lions' 400 freestyle relay is ranked fifth.